While much of Black Hollywood decided to boycott this year’s Academy Awards, there were a few YBF celebs that still came out. 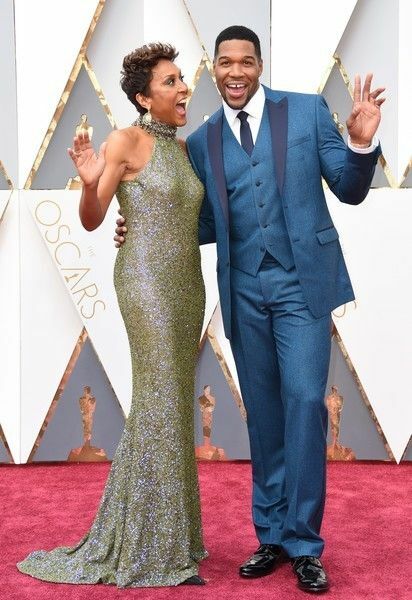 Peep carpet arrivals from Kerry Washington, John Legend, Chrissy Teigen, Common and more inside…. The 88th Academy Awards, dubbed #OscarsSoWhite, went down at the Hollywood & Highland Center in L.A. hosted by comedian Chris Rock. Many YBF celebs boycotted the event in a protest for inclusion, but there were a few YBF celebs that still stepped out. “Scandal” starlet Kerry Washington sashayed down the carpet in a black-and-white leather high-slit Atelier Versace dress from the Spring 2016 collection. She finished her look with Gianvito Rossi heels and Harry Winston jewels. Nailed it! On the carpet, Kerry touched on diversity stating she admired the people who decided to boycott the Academy Awards, but she felt her voice is best used "at the table" as a new member of the Academy. She said she wanted to be part of the conversation, so the awards show can be as inclusive as possible. We can't wait to see her as attorney Anita Hill in the upcoming HBO film Confirmation. A pregnant Chrissy Teigen glowed alongside her husband John Legend, rocking David Yurman cufflinks, as he rubbed her growing baby bump on the carpet. The happy couple will be welcoming a precious baby girl soon. The soon-to-be first time mom’s maternity style is on point! The Oscar winner also cleaned up nice in a tailored tux. 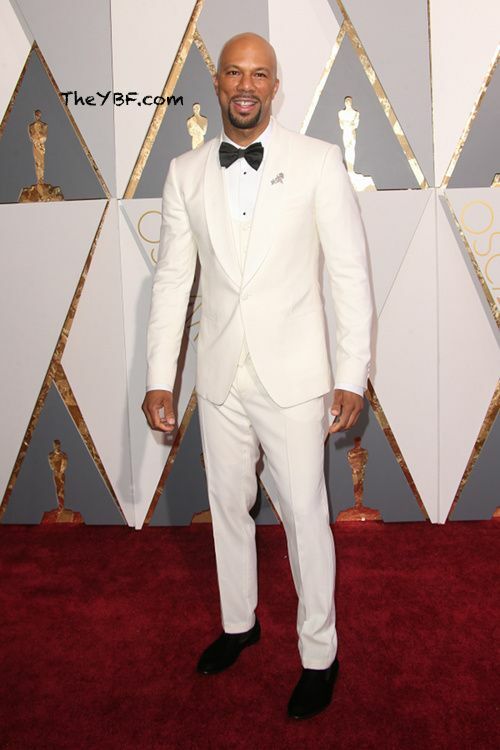 Oscar winning rapper Common, who's currently filming a new film, kept it dapper in a tailored white Dolce & Gabanna suit. 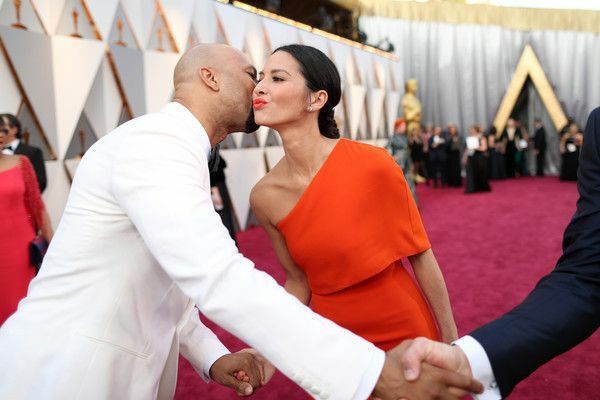 He greeted actress Olivia Munn with a kiss as he made his way down the carpet. He was tapped to present with John Legend. R&B Crooner The Weeknd flashed a smile on the carpet before hitting the stage to perform his Oscar nominated track "Earned It." Ride Along 2 star Kevin Hart, rocking a Dolce & Gabanna suit, and his fiancee Eniko Parrish, styling in a Fausto Puglisi high slit one-shouldered gown, brought the coupledom fab in all black ensembles. They look good! Werk! "Good Morning America" host Robin Roberts slayed in a sparkly Badgley Mischka gown, Dior shoes and David Yurman jewels. So classy and elegant. She ran into "Live with Kelly & Michael" host Miachel Strahan and had some fun snapping a few flicks with him on the carpet. Well here's a surprise. "The View" co-host Whoopi Goldberg, who has hosted the Oscars four times, wore black custom gown by The Danes designers in NYC. 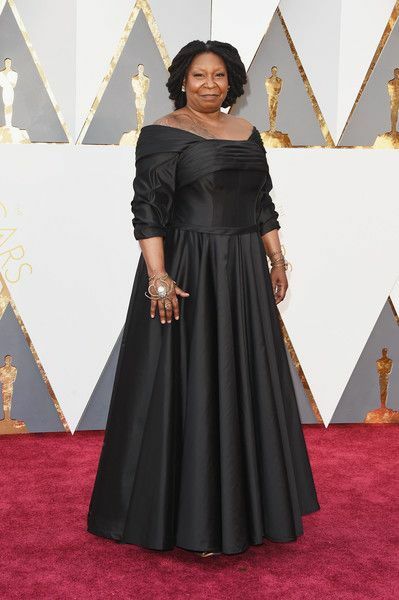 Nice seeing Whoopi in a dress. She was taped to present an award. Soulful singer Andra Day was spring ready serving old Hollywood glam in a pastel yellow asymmetric SAFiYAA gown. 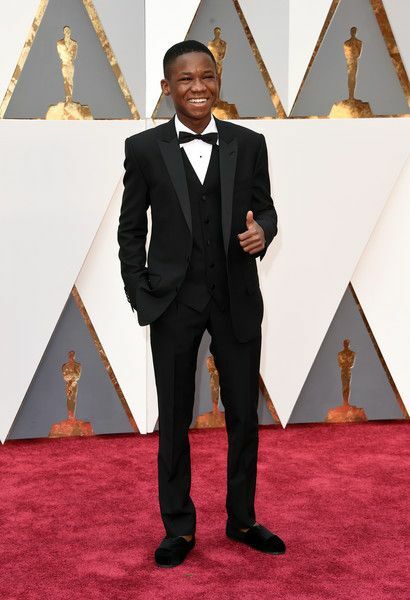 Beasts Of No Nation star Abraham Attah was all smiles on the carpet before hitting the stage to present. The 15-year-old star won the Best Actor Award at the Spirit Awards last night. Congrats again! 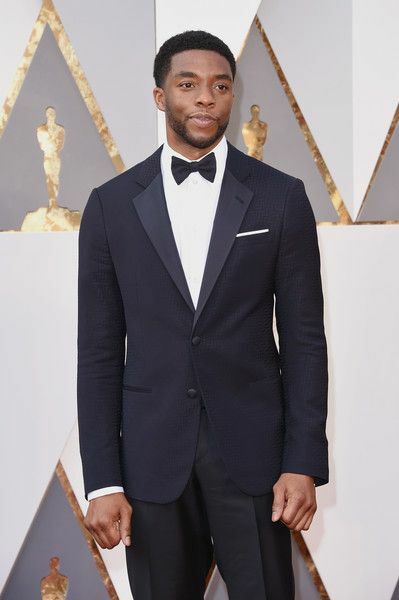 Black Panther star Chadwick Boseman hit the carpet before taking the stage to present. Superproducer Pharrell Williams and his wife Helen kept it simple on the carpet. P was tapped to present an award. "EXTRA" red carpet correspondent Tracey Edmonds dazzled in a peal beaded gown by designer Lorena Sarbu. She styled her look with Stuart Weitzman heels and Forevermark jewels. She looks amazing. "E!" correspondent Zuri Hall turned up the heat in a sweetheart neckline mermaid gown for the network's red carpet coverage. Gorge. 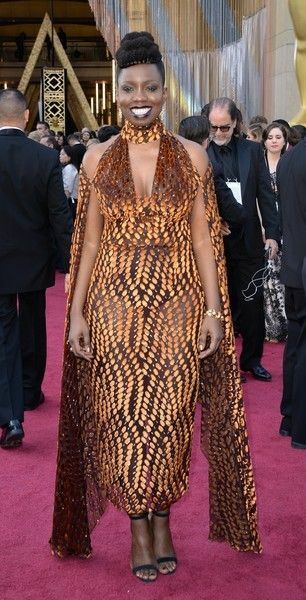 Fashion designer Adepero Oduye made a bold statement as she trekked the carpet. Are we feelin' it? 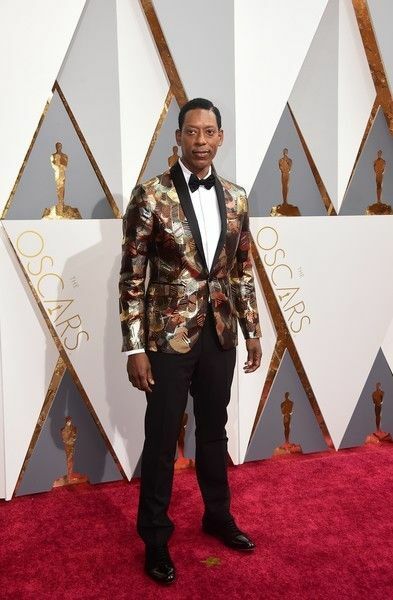 “Sleepy Hollow” star Orlando Jones popped up on the carpet in an interesting ensemble. He's tapped to host "The Oscars Backstage" on Oscars.com. 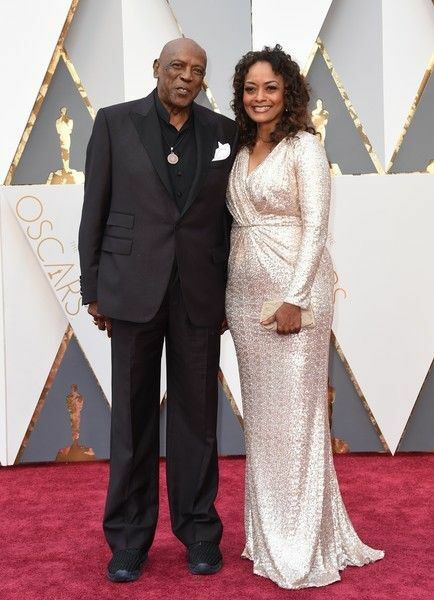 Oscar winner Louis Gossett Jr., one of only 13 black actors to win an Academy Award, was all smiles alongside his date. He was tapped to present during the show. 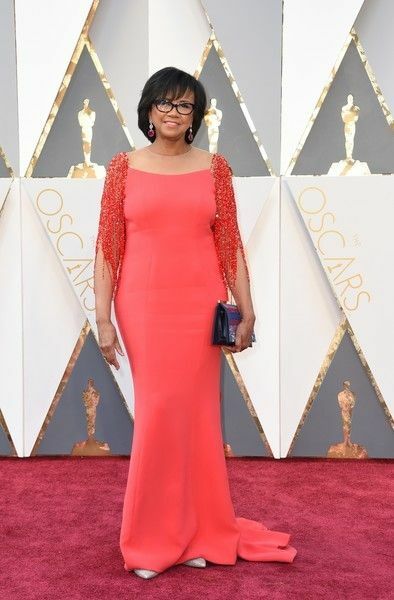 Academy Awards president Cheryl Boone Isaacs lit up the carpet in a coral gown with a mini train.